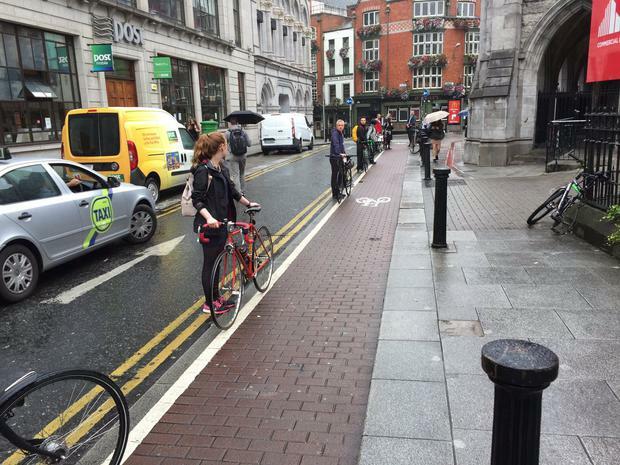 A group of 17 cyclists have "formed a human chain" to protect the cycle paths in Dublin city centre from being used by illegally parked vehicles. The protesters gathered to protest against cars parking on the St Andrews Lane and Westland Row cycling paths. I Bike Ireland protester, Ciarán Ferrie told Independent.ie that their group consists of cyclists who came together on Twitter a number of weeks ago due to their "frustration" at cycle lanes being invaded by loading trucks and other vehicles. "We felt our complaints to the Department of Transport and to the companies who owned the loading trucks weren't getting anywhere. We decided that there was only so much getting angry on social media could achieve and we began our campaign two weeks ago," Ciarán told Independent.ie. He said that the protests began two weeks ago and that they chose St Andrews Lane as a starting point as it is a contra flow cycling lane. This means cyclists must cycle in the opposite direction to other traffic and can be particularly dangerous. "We began two weeks ago on June 27 and met again last Tuesday after 4:30pm and took in Westland Row where cyclists also suffer from the same problems," said Ciarán. Ciarán explained that most people passing by were supportive and that some companies even agreed to park elsewhere as a result of I Bike's protest. "Drivers and those walking by were supportive and curious and asked us about what we were doing. One company even said that they'd find somewhere else to park. We're not doing this to create confrontation. We want to raise awareness," said Ciarán. 10 people have been killed in cycling accidents this year, which is the entire number of people who lost their lives while cycling in 2016. Ciarán who cycles to and from work in Dublin every day has been involved in cycling accidents before and hopes that this protest makes even a "small difference". "I was knocked off my bike by a motorcycle before and constantly see vehicles weaving in and out of cycling lanes, so hopefully our campaign will help things change," added Ciarán. The group are due to meet again next Tuesday and hope to spread their campaign to other areas around the city in order to raise awareness of cycling lanes.